Monderer Design has completed its 15th year providing event sponsorship and design expertise for the MIT Sloan Boston Alumni Association’s annual Chief Financial Officer conference. Our role included creating a 36-page CFO Symposium program, event/location signing, event website, presentation templates and more. 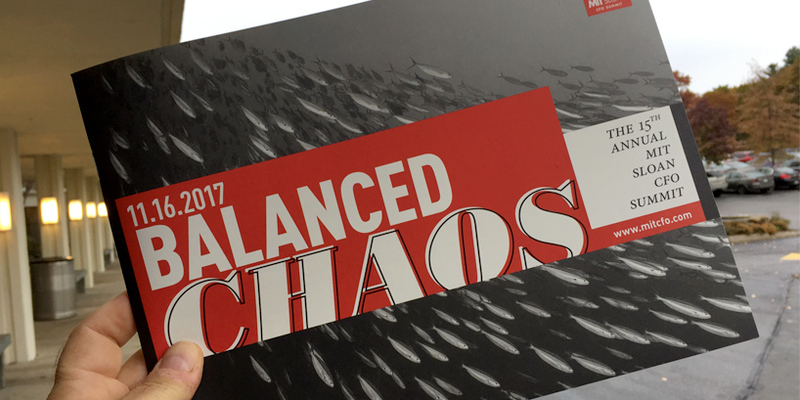 Over 600 CFOs and senior financial executives from leading companies gathered at the Boston/Newton Marriott to exchange ideas on this year’s theme – Balanced Chaos. The MIT Sloan CFO Symposium brought together financial executives from around the world and leading faculty from MIT for an annual one-day conference which this year focused on how CFOs make decisions and manage uncertainty.